Jersey sea kayaking guides, articles and press cuttings about kayaking in Jersey, Guernsey, Alderney, Sark, les Ecrehous and les Minquiers. Derek Hairon is the author of the Channel Island and South East Coast Sea Kayaking guide book (Pesda Press). 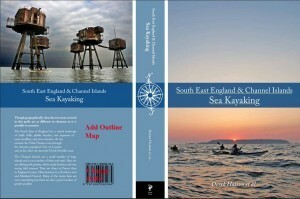 All you need to know about sea kayaking in the Channel Islands. Les Ecrehous – a splash of colour. Derek writes about this superb destination in The Paddler Magazine. Jersey Sea Caves. North coast sea caves to explore by sea kayak. The Paddler Magazine. 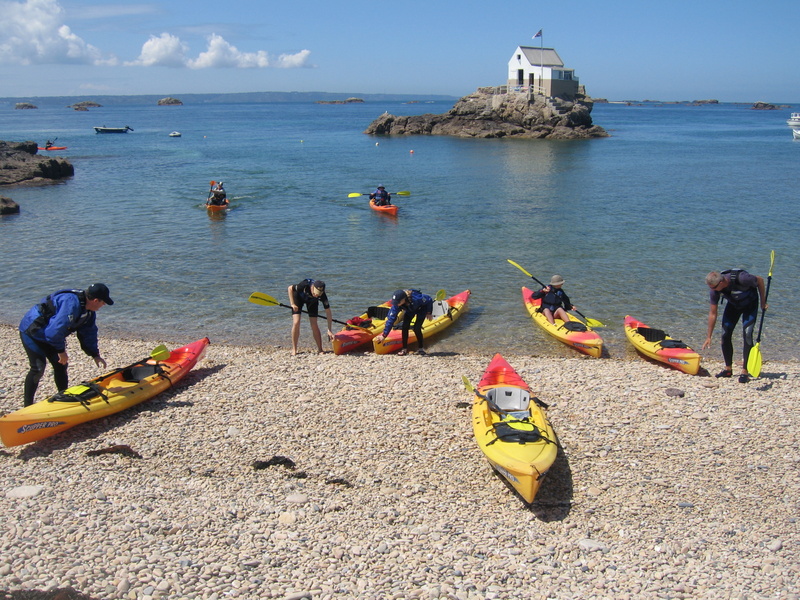 Sea kayaking in Alderney– Derek Hairon writes about a sea kayak trip to Alderney -the most northern Channel Island- which is famous for it fast tide races. Published in Ocean Paddler. Kayaking Around Jersey– by Tamara Nance. A personal account of her circumnavigation of Jersey by sea kayak. An example of how you can have an outdoor adventure sea kayaking in Jersey. Hidden Island – Canoe Focus. Sea kayaking the caves of Jersey. Les Ecrehous– by Hazel Irvine. An offshore adventure to les Ecrehous. The Colours of Spring– By Clive Tully. An adventure holiday in Jersey. La Maitresse Sauvage. Les Minquiers– by Jane James, in the award winning Club Hotel and Spa’s in house magazine. An adventure tour to the most southerly island in the British Isles and home to the most southerly toilet! Kayaking, surfing and coasteering. Watersports in Jersey-by Ed Leigh. Pure Jersey Magazine. Jersey’s hidden charms-Daily Telegraph magazine. Off Jersey’s north-east coast lies a series of smugglers’ islands, most of which are submerged at high tide. Tim Burrows writes about our boat and kayak tours to les Ecrehou. Landing at les Ecrehous. Jersey is on the horizon. Guide Endorsement Success for Jersey Kayak Adventures. Visit Jersey 2018. Kayaking the East coast of Jersey. Karen Bowerman writes about here kayaking trip in Pure Jersey magazine 2015. Sea Kayak Centre Wins Environment Award. Our Jersey Enterprise Environment Award gets a mention in Canoe Focus, the magazine sent out to members of the BCU. “Derek Hairon’s Bucket list”. Our Director and BC level 5 coach lists his top things to do before he gets ancient in the Jersey Evening Post. Free kayak safety classes initiative in Jersey. Jersey Evening Post. Lonely Planet Magazine. 11 best things to do for an active weekend in the UK. The Green Traveller. Green Travel list 2010. Jersey Watersports Heaven– Maggie King. Small World Magazine. Adventure activities with children in Jersey. So Wild ist Jersey– In German by Oliver Abraham. Die Welt newspaper. What Lies Beneath. (Daily Telegraph). Near and Far (Daily Telegraph). Mother Nature– Gabriella le Breton explores the outdoor activities in Jersey. BBC Coast series 3 featured Neil Oliver kayaking to Les Ecrehous with Derek Hairon of Jersey Kayak Adventures. Discover Jersey’s Adventurous Side– Matt Hill BMI baby flight magazine. The Guardian Green Travel List 2010. Jersey Enterprise newsletter. We are on page 2. Green Tourism Business scheme Silver award. The magnetism of ‘Green Jersey’. Phillipa Jacks writes about Ecofriendly and Green Tourism in Jersey. A kayak tour with Jersey Kayak Adventures is featured. Her blog contains lots of Eco friendly advice and guides. Top kids’ attractions to enjoy in Jersey. 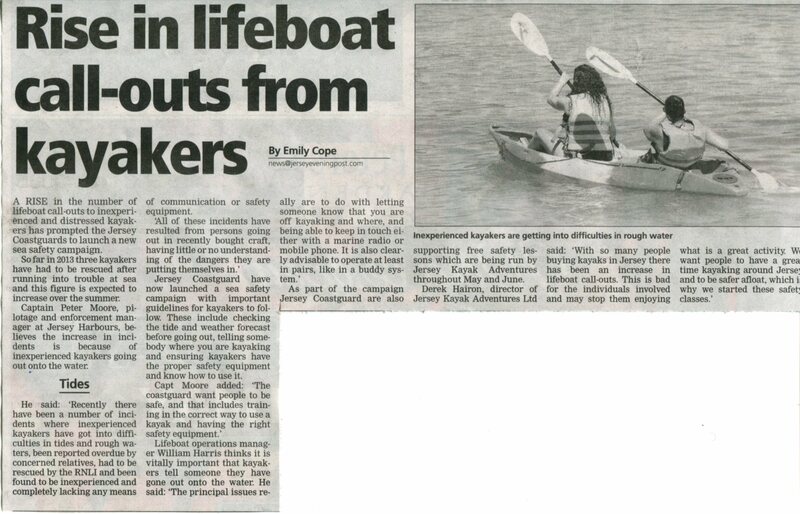 Written by Derek Hairon, Director of Jersey Kayak Adventures and British Canoe Union level 5 coach. £9.99 with detailed colour photos. Buy your copy directly from the author (postage free in Jersey).